This rare Stag Beetle belongs to the beetle family Lucanidae. It is large sized with a metallic green and purple body sheen that makes it one of the most attractive beetle species in Australia. These are notably longer in the male than the female. It is restricted to wet areas in North Queensland rainforests, where it lives among rotting logs and tree stumps and is eagerly hunted by collectors. Despite this armoury stag beetles are mainly vegetarians. Adults feed on nectar, young leaves, sap and fruit. Although Mueller's stag beetles occasionally visit the verandah lights at Chambers Wildlife Rainforest Lodge , most sightings are achieved by keen enthusiasts who search them out. They are nocturnal and sometimes attracted to lights. 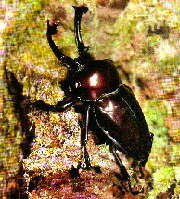 In the larval stage the beetle is completely dependent on dead wood which has been infected with fungus. The males 'antlers' are used as levers during conflict. Each tries to pass them under the rival's body to raise and dislodge them. Stag beetles are kept as pets in Japan and can be bought from vending machines. Recently one measuring 80mm, which was 1mm longer than the previous record holder, changed hands for the equivalent of $135 000. It is against the Law to remove Mueller's stag beetles from any National Park or Crown Land within Australia or to attempt to transport them overseas. Australia is home to more species of stag beetle than most parts of the world, the majority live in the cooler southern forests. In the Wet Tropics, they are most divers at higher altitudes. The most recently discovered species is a flightless form known only from Mt Lewis.